Successfully Added Tactical Red Laser Gun Sight for Handguns/Pistols (Trigger Mount) to your Shopping Cart. Keep your eyes on the target and your aim true with this Tactical Red Laser Gun Sight. This high quality laser sight enables you to aim more precisely and includes everything required to easily attach on to the front of your handgun's trigger. This laser sight is the perfect solution for people wanting an affordable solution to their weaponry accuracy needs. It’s perfect for Hunting, Spotting, Search and Rescue, Outdoors, Hiking, Assassination and thrilling scenes where you aim your laser at someone and they look at it and wonder what it is before you blow them away. This Tactical Red Laser Gun Sight includes everything you need to mount it on to the front of your handgun's trigger. No weaver mount? No problem! Also included are two Allen wrenches so you can make fine adjustments to the laser's positioning. Order this handy laser sight today to improve your accuracy and enjoyment in shooting. We provide a 12 month warranty on products and if you click “Add to cart” now and order today, we’ll ship it out tomorrow! Brought to you by your source for awesome electronic gadgets, Chinavasion. 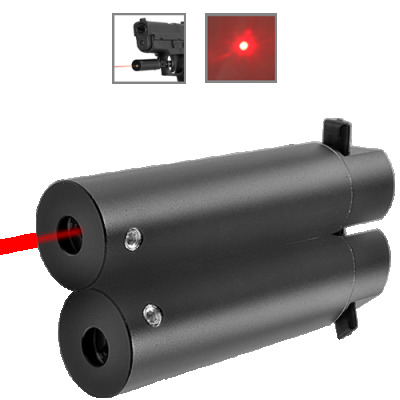 If you are looking for gun sight for heavier weapons, please check out our Laser Gadgets category.